Three small chubby brothers. Three tasty dishes for the Big Bad Wolf. So, how to stand up for these good-natured creatures and save them from the strong claws of Mr. Grey Evil? Playing Piggy Fortunes slot machine, you can find the quiet nook created by Microgaming and punish the furry offender as well. The money reward will be waiting for you on 25 paylines. The Wolf is eager for the fresh pork. That’s why, he hunts for our Piglets. Day and night. Without leaving 5 reels. So, you need to be in a hurry then! So that the sharp-toothed chaps can’t reach the crimped tails of our pink friends in a no download version. It’s much better to draw the wolf’s attention away with bringing you the top summer jackpot of 13,500 coins, the adventurous Bonus Feature with the scatter prize and many other ones. Boo! Here the Big Bad Wolf suddenly emerges from behind the tall tree and growls so that to inspire fear. Acting like the wild symbol, this Brigand of the Forest poses the hazard to all the slots symbols apart from the scattered Piggies. They are the only ones that are not afraid of this Wild Wolf. What about you? Does he also throw a scare into you? You can change your mind after catching the first win with the wild substitution. Maybe it’s strange but… You can see the Big Bad Wolf giving a wink at you. Isn’t it really an unexpected slots turn, ah? Your lucky gambling will please you as well as Three Little Pigs that play the part of the scatter symbol. In spite of the fact they look merry and light-hearted, these amazing Snout Fellows are really crafty and… Generous too. As they can offer you the astounding award of 37,500 coins for getting 5 scatter symbols while playing with the maximum bet. Noticed 3, 4 or 5 Pig-Bro images scattered on the reels that are covered with the green grass and leafage? Hey! The Big Bad Wolf Feature is triggered then! There the Shaggy Villain will show you his force breaking and demolishing everything on his way. No matter it’s sunny or the gambling sky is clouded over… You need to be on guard while playing this slots at one of the top Microgaming casinos online. As the fearful Wolf keeps his eyes and mouth open. For the delicacy and your stakes. So, choose how much money you can put per spin taking into account that there is the minimum one of $0.25 and the maximum bet that counts $75. In addition, the coin denominations varying from $0.01 up to $0.20 are at your disposal. So, you are free to set your choice on any of them. Note! Up to selected 15 coins can be on every fixed line. Try to guess where the precious Piggy prizes are safe and sound… Certainly! In the Brick House! So, it just takes you to find the keys to these 5 Houses made of hard stone and… The most sheltered jackpot of 13,500 coins or $2,700 is yours! The only thing to remember is to spin the reels with the largest coins and all 25 lines accepting the maximum number of coins. Wanna some help? Then, stop the reels whenever you like thanks to the special feature. 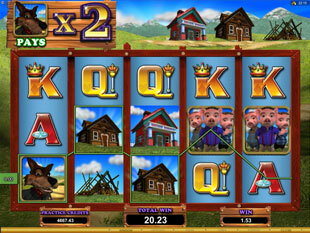 Watch the picturesque gambling screen as any moment 3 or more Little Pigs symbols can appear there. So that to take you to the Big Bad Wolf Feature. Awarding you with the limitless Free Spins that are incredibly destroying and crashing ones. But… Every ravage will surely bring you the mind-blowing presents. So, Sir Angry Eyes is approaching already… 1-2-3 and… He can sneak up to the houses if jumping on the reels adjacent to any of them. The straw, wooden or even brick one… The Wolf is capable of making the ruins of all these Pigs’ dwellings. Moreover, it plays into your hands! Is the straw hut blown down? Yahoo! You get 2x multiplier. Can see the wooden little house vanishing just in front of you? Hey! Grasp the multiplier of 3x for that! Is the solid brick construction broken into pieces? It’s worth the cool multiplier equal to 4x. The wreckage is all round… So, where are our buddies going to live now? Well, they are the real sloggers that are able to restore their cosy houses. Just give them a helping hand and try to hit 3 or more scatters during the bonus. As soon as you do that, three Piglets will commence rebuilding their places chosen at random. The feature is over when all three houses are levelled to the ground. However, take a chance to gain the highest multiplier for the Wild Wolf replacing other symbols. Before you finish enjoying the bonus game. 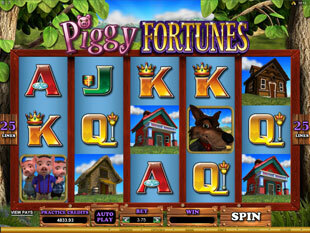 Piggy Fortunes slot machine offers you the popular tale told in a new way by Microgaming group. 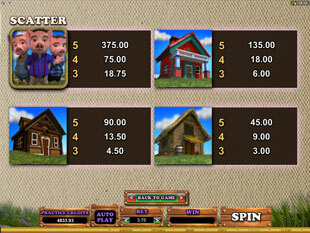 The precious gambling treasures, the grand jackpots and the extra bonuses… All of that is hidden in the hoof-made houses. 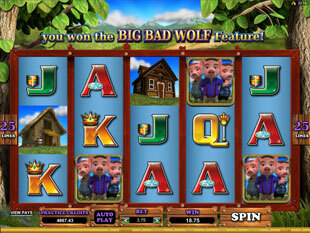 So, protect them from the spiteful Grey Wolf and get ready to make it TOO hot for him with this Free Spins video game!